This article is about the insect. For the musician in the band Red Hot Chili Peppers, see Flea (musician). 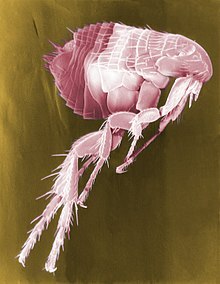 False colour scanning electron micrograph of a flea. CDC image. The flea (siphonaptera) is an insect that lives on many kinds of animals and sometimes humans. Fleas are considered parasites, and they drink the blood of the animal they bite. Fleas can live outdoors in sand or tall grass, and they will jump to any passing animal and lay eggs. Flea bites are usually red bumps and they itch. They can carry disease and make animals sick. There are several types of flea including the dog flea, cat flea, human flea, northern rat flea, and the oriental rat flea. During the Middle Ages, the oriental rat flea spread a bacteria that caused the Bubonic Plague, also known as the Black Death or Black Plague, a huge epidemic much more severe than today's bird flu. The oriental rat flea would become infected by the bacteria Yersinia pestis. After infection the bacteria grew inside of the flea, eventually blocking the path to its stomach. Because of this, the flea was always hungry. When the flea would bite a human it opened up the skin but since the stomach of the flea was blocked, the blood from the human was heaved up back into the human, only this time it was infected with the Bubonic plague bacteria. This page was last changed on 15 May 2018, at 18:03.